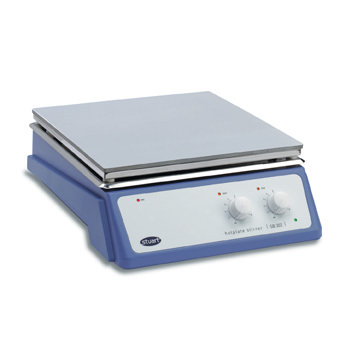 Stylish and economical, general purpose stirrer hotplates designed with safety as well as performance in mind. The "Hot" warning light will flash whenever the plate temperature is above 50°C and will operate even when the hotplate is turned off and connected to the mains. Powerful magnets and motor give stirring speed up to 1500rpm and volumes up to 15 litres. 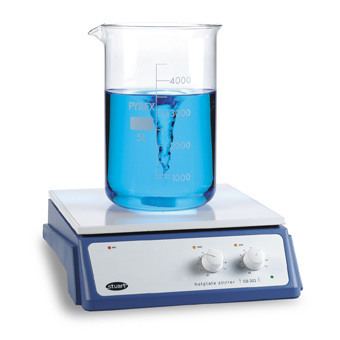 Model CB302 has a glass ceramic top that has excellent chemical and temperature resistance. The chemical properties make the surface very easy to keep clean and the thermal properties allow very high plate temperatures while ensuring the edges stay cooler, reducing the chance of accidental burns. Model SB302 has a robust aluminium/silicon alloy top plate. The very good heat transmission of this material gives rapid heating and ensures even temperature distribution across the whole of the plate.